The Bulls started the week out by hosting the Charlotte Bobcats. After an embarrassing game against the Bobcats in a New Year’s Eve loss, the Bulls were looking for some redemption. Mission accomplished for them, as they won 93-85. Luol Deng returned after missing five games due to a hamstring injury. He scored 12 points in the 31 minutes he played. With Deng back in the starting lineup, that meant Jimmy Butler returned to the bench. It did not matter. Butler came off the bench to lead the Bulls with 19 points. 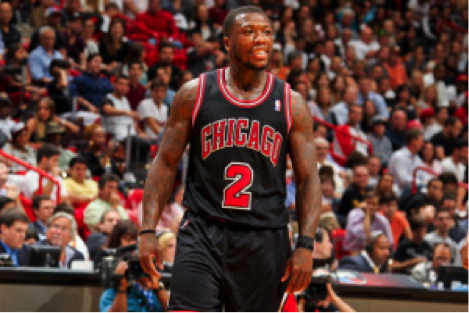 Nate Robinson also came off the bench and he scored 15. For his part, Butler gives credit to the team’s leaders for giving him the confidence to continue his play. “I think it hit home the most when Luol came up to me and said, `You can do this. This is your time, step in and keep playing the way you have been playing.’ When you hear that from an All-Star, from Derrick and Jo that’s big. I have been here for almost two years now-I think that’s what I need to hear,” Butler said. After Monday’s home victory, the Bulls embarked on a 6-game, 2-week road trip. The first game of the trip was Wednesday at Milwaukee against the Bucks. This was another redemption game for the Bulls. They have played the Bucks twice this season and both times they blew second-half leads, one of them a 27-point lead. They would not blow a third lead, and they won the third matchup 104-88. Deng returned to his accustomed place, leading the Bulls, scoring 12 points, grabbing 13 rebounds, and dishing out 5 assists. His minutes were back up as well. He played 40 minutes, keeping his hold on averaging the most minutes in the league. Butler, a Marquette alum, scored 18 points and grabbed 5 rebounds in the arena where he played his college ball. Robinson scored 24 points, 16 of them in the 2nd quarter, where the Bulls outscored the Bucks 32-18 to take control of the game. On Friday the Bulls traveled to the new Barclay’s Center in Brooklyn to face the Nets. They were very shorthanded, playing without starters Boozer, Noah, and Hinrich. They still played hard, but ultimately did not have the guns to keep up with the Nets, and lost 93-89. The Bulls’ top-notch defense faltered in the 4th quarter, allowing the Nets to shoot 11 of 18 from the field. Nine of those shots came from the Nets’ bench players. Deng scored 18 points, and Taj Gibson scored 16 points and grabbed 9 rebounds. Robinson had 12 points and 11 rebounds, but he shot 4-16. On Saturday, the Bulls road show hit the halfway mark in Atlanta against the Hawks. Again, they were without Boozer, Noah, and Hinrich, but this time the other guys came through in a 93-76 whitewash. Deng led the Bulls with 25 points and 14 rebounds, while Gibson had 19 points and a career-high 19 rebounds. Butler also had a double-double, scoring 16 rebounds and grabbing 10 rebounds. The spark plug for the team again was Robinson. He had 20 points and 8 assists. After shooting 4-16 the previous night, he shot 8-16 in Atlanta, including 4-6 from 3-point range. After allowing the Hawks to score 27 points in the 2nd quarter, the Bulls allowed 32 points in the ENTIRE SECOND HALF. Even though they were short on players, the Bulls showed their pride on defense and were still upset that they gave away the game the night before. Deng, Gibson, and Butler each played over 45 minutes, while Robinson logged in 40 minutes, continuing the hard play long after they had already secured the victory. To me it seemed that the shutdown of three starters was for the playoff run. Some players have some nicks and bruises and have injuries that normally would not keep them out of games, but they get some rest, and some of the bench players get good, meaningful minutes. “This is good for our team. It’s all for the better come playoff time when we get everybody back and we’re fully healthy, we feel like we’ve got a shot of winning the East,” Gibson said after the Brooklyn game. The Bulls finished the week 3-1, and have a one game lead in the Central over the Indiana Pacers. They are currently the third seed in the Eastern Conference, 2 ½ games behind the Miami Heat, and 2 games behind the New York Knicks. Not many would have thought they would have a record of 29-18 at this point playing without Derrick Rose, but here they are, and The Return is nearing. This week the Bulls finish up their road trip. They play the Pacers tonight in what promises to be a hard-fought battle between the two best defenses in the league. Then they travel to Denver to play the Nuggets on Thursday, and finish up in Utah against the Jazz on Saturday. The Blackhawks were looking to keep their hot start to the season going. They traveled to Minnesota to face the Wild. In a close battle, the Blackhawks went down 3-2 in a shootout. Minnesota scored 90 seconds into the game when Matt Cullen scored on goaltender Corey Crawford. The Blackhawks then stormed right back, getting goals by Andrew Shaw and Jonathan Toews to make it 2-1. Wild’s coach Mike Yeo then pulled goalie Josh Harding and put in Niklas Backstrom and Backstrom blocked all 28 shots he saw. After a scoreless overtime period, the game went to a shootout, where Cullen struck again, his shot just scooting under Crawford’s legs. On Friday, the Blackhawks traveled to Vancouver to face the Canucks. Again, the game went to a shootout, and again, the Blackhawks lost, 2-1. The Canucks scored five minutes into the game, and it was not until halfway through the third period when the Blackhawks tied it on a Patrick Kane goal. Crawford had 21 saves, but it was not enough to keep the team from losing its second game in a row. Hurting after back-to-back losses on shootouts, the Blackhawks went into Calgary to face the Flames on Saturday. Once again, they were involved in another shootout, but they came out on top in this one, 3-2. Coach Joel Quenneville rested Crawford and started Ray Emery. Emery responded with a tremendous game, blocking a career-high 45 shots. The game was scoreless through the first two periods, then, in the third period, the fireworks started. The Blackhawks finally broke the scoreless tie on a Kane goal. Then Calgary tied it just past the 13 minute mark. The Flames dominated the period, having 24 shots on goal, to the Blackhawks’ 6. It seemed like they were going to be handed their first loss in regulation when Calgary’s Jay Bouwmeester scored with just 35 seconds remaining. The teams then had a furious scramble by the net and Marian Hossa tied the game with 2.3 seconds left in regulation. After a scoreless overtime period, Kane scored the game-winner. The Blackhawks have now gone into extra play in four consecutive games, and five of their nine games this season have gone to extras. They are getting tested early in the season, and hopefully it will prepare them come playoff time. Their record now stands at 7-0-2 and they sit atop the Western Conference. This week the Blackhawks face San Jose to face the Sharks. They play the Coyotes in Phoenix on Thursday and travel to Nashville to face the Predators. Well, that is all for this week. Enjoy the upcoming games and now that the football season is over, let’s talk free agency and mock drafts!